Hailed for "style and elegance" and "drama and rhetoric" (Strings Magazine), and "lyrical yet impassioned interpretation" (Fanfare Magazine), Lawrence Stomberg enjoys a wide-ranging career as soloist, chamber musician and pedagogue. Since his debut at Weill Recital Hall at Carnegie Hall in 1999, he has been a featured performer as faculty at the Eastern Music Festival and Texas Music Festival, performs annually at the Techne Music Festival and Master Players Festival, and was a founding member of the ensembles Trilogy, the Johannes Trio, and Brightmusic. Recipient of the 2018 Delaware Division of the Arts Established Artist Fellowship, Stomberg will serve in his 13th and final season as cellist of the acclaimed Serafin String Quartet, performing with them throughout the United States. Recent seasons have brought him to venues across four continents, performing as soloist and collaborator in London, Vienna, and Bogotá, as well as cities and towns across the United States, including recent premiere performances of British composer David Osbon’s Cello Sonata, a cycle of Beethoven’s Cello/Piano works across Europe and the United States, and an early performance of a co-commissioned concerto by British-American composer Richard Prior. In the past season, he presented the complete Suites for Unaccompanied Cello by J.S. Bach, with commissioned companion works by Swift Rose, as part of a project combining music and civic conversation in Wilmington, Delaware. His debut recording, The American Cello, was released in 2000, and he was a featured performer in two critically acclaimed CDs released in 2013, with music by American composers Jennifer Higdon (on Naxos Records) and Kirk O’Riordan (on Ravello Records). He has also recorded for the VAI and Centaur labels. As an orchestral performer, he served as Assistant Principal Cellist in the Oklahoma City Philharmonic and as a member of the Tulsa Philharmonic and Eastern Philharmonic Orchestras. 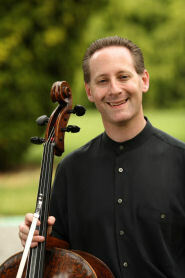 An active and dedicated pedagogue, Stomberg served on the faculties at Truman State University in Missouri and Oklahoma State University before joining the music faculty at the University of Delaware in 2004, where he is currently Professor of Cello. He lives in Wilmington, Delaware with his wife, cellist Jennifer Crowell Stomberg, and their children. "A key player through all four seasons was cellist Lawrence Stomberg. His close attention to [Julia] Fischer's lean created tight ensemble between the several duets the two played."